The state of Rajasthan is known for its rich regal culture and heritage. The arid and dry nature of the region, the extreme climatic conditions, scarcity of water and vegetation has witnessed evolvement of unique cooking styles and food habits of the natives that is quite different and unique from other Indian cuisines. Scarcity of water in the region has witnessed extensive use of dairy products by the inhabitants like milk, butter and butter milk so as to compensate or reduce the water content while cooking. Beans, dried lentils and legumes like gram flour, bajra and jowar form the main ingredients of many of the Rajasthani dishes. Ghee is liberally used in preparing different Rajasthani dishes which are rich in spice and flavour. 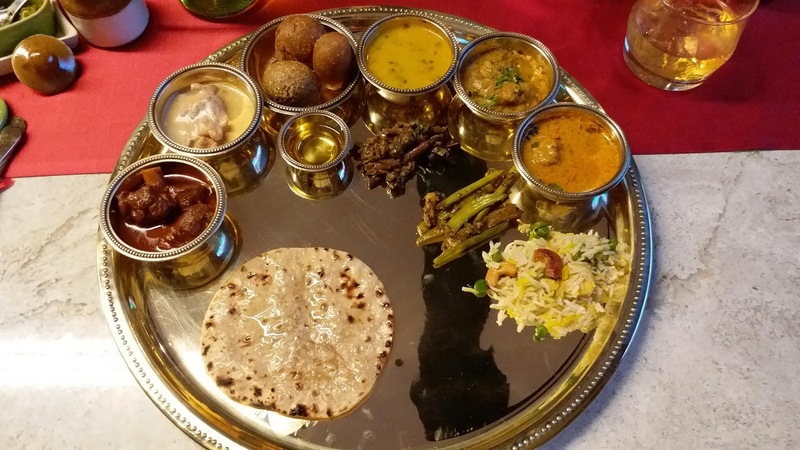 The royal heritage of the region as well as the gastronomic enthusiasm among locals have led to a wide variety of delectable and exquisite Rajasthani dishes starting from main courses to snacks to sweet dishes. Some items like Dal-Baati-Churma and Laal Maas have garnered both national and international popularity among foodies. One of the most popular cuisines in India, Rajasthani dishes are loved and relished by most Indians as well as foreigners. To enjoy this flavourfully rich cuisine we were Invited by the Courtyard Marriott Gurgaon who have specially called chefs and Maharajs from Rajasthan to cook the best and the most authentic dishes from the region. The Moong Dal ki Tikki, Mirchi Pakoda, Mutton Boti served with an array of pickles and chutneys were just amazing. The Gud ka Sharbat and the Bel ka Sharbat are the most nourishing coolers in this season and a must have with the meal. Don’t miss the most delicious Laal Mass and the Safed Murg including the most sought after Gatte ki subzi and the ever so popular Ker Sangri the dried berries and beans. How can they forget the cult Dal Baati Churma. Baati was just to die for totally immersed in pure ghee and in three different variants. Desserts Ghewar and Besan Burfi are just delicious. The Courtyard Gurugram Downtown will host the Rajasthan Food Promotion from 23rd July-31st July at Dinner.